Here is my latest confession: I am addicted to the television show 24. This is not news, since the show was on for eight seasons and went off the air in 2010. 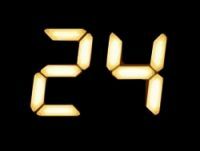 But it has resurfaced, with new episodes that began this past Monday as 24: Live Another Day. I am sucker for everything about 24—the format (the show purports to be happening in “real time” so that each minute of the 60-minute show is indeed a real minute in the world of the characters), the storylines (political terror and intrigue), and of course, the characters. Jack Bauer has become quite the icon in the pantheon of American heroes, and perhaps more accurately, anti-heroes, right up there with John Wayne’s Ethan in The Searchers or James Gandolfini’s Tony Soprano in The Sopranos. The flaws are clearly evident, but there is no one you want to succeed more in these situations than the antihero. No matter what Jack Bauer has been through, no matter what horrors he has seen, when he appears on the scene/screen, we (the viewing audience) know that he is here to save us all from ourselves. How comforting is that! Much has been written over the past 13 years about 24. Some claim that it pushed forward George W. Bush’s conservative hawkish agenda. Others protested its “justification” of torture and so-called “enhanced interrogation” as portraying them as effective information-getting techniques. For still others, it was simply too violent and wreaked of the terrorist anxiety that loomed so large in the post-9/11 universe. However, when I sat down to watch the two-hour premiere of 24: Live Another Day, I wasn’t so worried about the socio-political ramifications of what I watching. I wanted good old-fashioned television drama—old-fashioned not in the sense of technology but in the sense of great storytelling and great characterizations. I wanted to have no choice but to be glued to the screen for two hours, except for commercials. 24: Live Another Day not only opened with an action-packed introduction, but it also gave viewers some complicated characters with which to contend—the idea of a president who is trying to hide that he is dealing with encroaching dementia, a familiar and well-loved heroine who has been through torture and bears the psychological and physical wounds, as well as an old love from the past, who has also been through hell, and is now being sheltered from the truth. And then, of course, there is Jack Bauer. Early on, he tells us, “I have no friends.” He reminds us of the quintessential western hero—the one who must walk through life alone, even though he touches many lives as he moves through the world. He also tells us he can’t go home—to his daughter and grandchildren. He lives in a world where it seems he can only relate to others through violence—by using violence to prevent additional violence. In satirizing Georgia’s new gun law, which enables Georgians to carry a gun almost anywhere in the state, Stephen Colbert suggested there be in most buildings an “In Case of Emergency” gun inside a glass case, with a gun to break the glass. Colbert said this would be in the hope that since gun aficionados claim that the only way to stop a bad guy with a gun is a good guy with a gun, if everyone had guns, chances are good that there would be at least one good guy with a gun. However, in the real world, chances are slim that that good guy would be Jack Bauer. Watching Jack Bauer gives us an opportunity to think about those of us who don’t fit in, those of us who feel on the fringes of society. Granted, those of us on the fringes don’t all resort political violence, but it is important to remember that we don’t all fit in. Sometimes, it may just be our families into which we don’t fit, but maybe it is our larger community—our school, our neighborhood, our city, or our country. We still need to be present to those who don’t conform. What if the Jack Bauers in the world had someone who were present to them? We may lose our real life action heroes, but really, we don’t have them anyway. And Jack Bauer will be there for us in perpetuity in digital archives, saving our world over and over again. Phew!